What size Skidsteer are you looking for? 1.3 tonne Bobcat S70 skidsteer. With a free trailer & cleaning. 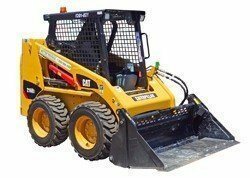 Looking for a full size Cat skid steer loader? Free Cleaning; Our simple “no cleaning fee ever” (well – except for paint, concrete and other stuff we can’t remove with a water blaster) policy means you don’t need to try and work out how to clean the bobcat skidsteer with a hose and brush – we do it quickly with our high pressure cleaning gear. Free Smudger Bar / Leveller; let’s you finish the job properly. And of course a PRA, all safety equipment and paperwork to keep your job-site safe. And we don’t add extra “Environment” Charges or Miscellaneous bits and pieces at the end of the hire that turn a low quoted rate into a big invoice. Fuel – we provide it full and charge for whatever isn’t returned. To prevent tipping – machine not to be used on slopes greater than 15°. For Stability: Never Travel with bucket raised above base of machine body. No Damage Waiver applies for damage to machine or engine caused by tipping. Since 1986 we’ve been hiring to some of Melbourne’s biggest infrastructure jobs. We’ve developed a wealth of experience – and a great team with the skills to make your job easy. All safety equipment and paperwork to keep your job-site safe. And we don’t add extra “Environment” Charges or Miscellaneous bits and pieces at the end of the hire that turn a low quoted rate into a big invoice. Our “On Time Or Delivery is Free” Guarantee leaves the risk of a late delivery with us. Our fleet of delivery trucks do the vast majority of our deliveries so you know it’ll be delivered on-time by someone who cares. Only brand we hire in the larger size is Caterpillar. Quality skidsteers backed by the service and experience of Better Rentals. And all necessary paperwork to ensure the smooth running of your jobsite and operator safety is provided. So, why hire a Mini Bobcat skidsteer and Trailer from Better Rentals? Hire the right size Bobcat skidsteer for the job : We have smaller 1.3 tonne Bobcat S70 mini skdsiteer for smaller jobs. 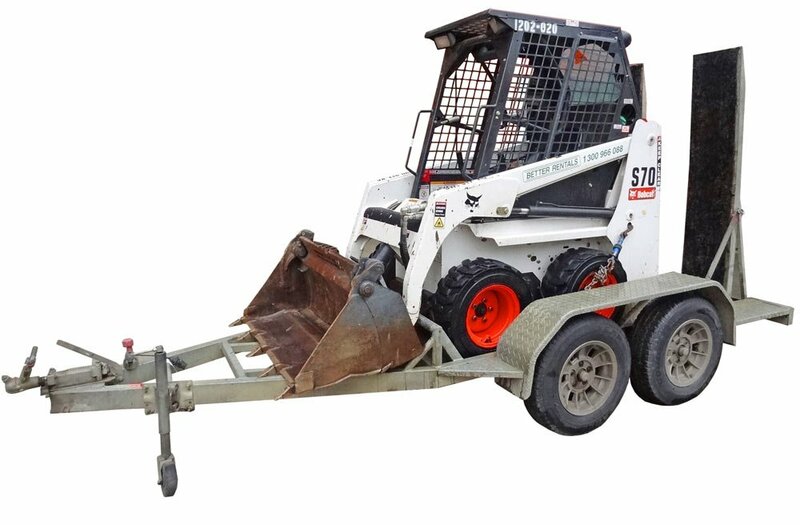 Bobcat Skidsteer Hire with trailer to reduce your costs : We include a trailer in the 1.3 tonne Bobcat skidsteer Hire price . This allows you to reduce your total hire cost to a minimum by towing the skidsteer to site yourself. 24 hour/7 day service : We’re dealing with machines and from time to time you may have a problem. Just call the branch you hired from and someone will help. FOR YOUR SAFETY: To prevent tipping – machine not to be used on slopes greater than 15°. For Stability: Never Travel with bucket raised above base of machine body. No Damage Waiver applies for damage to machine or engine caused by tipping. Increase the number of jobs you complete with your hire. 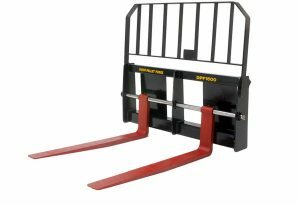 Power Rakes, Smudgers and Fork Attachments available for hire with your skidsteer or ours. Need to move pallets or other items? Fork attachments will help.